Little House Home Arts: Testimonial--Little House Pincushions are "Beautiful and Delicious"
Testimonial--Little House Pincushions are "Beautiful and Delicious"
My pincushion: Beautiful and Delicious! As I was writing my last blog, "Ode to My Father--Insanity Helps", I received an email followed by a phone call from one of my customers who is quickly becoming a dear friend, Emmett McCarthy. He is familiar to many as a former contestant on Project Runway and is now a successful fashion designer in NYC. Along with his artistic talents he has a great sense of humor and didn't want me to miss out on his artist friend, Lisa Zador's chuckle of the day, that Emmett had titled in an email to me, "Beautiful and Delicious". He was speaking of my tomato biscornu pincushion that he had given to Lisa. She had it sitting in her windowsill in her studio when she experienced an intruder, one that had broken-in and entered through her window screen before. 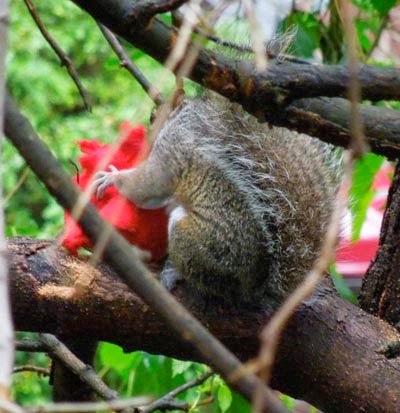 This time her courtyard squirrel had stolen her favorite pincushion! Don't miss the rest of the story on her blog, and while you are there don't miss going to her Etsy shops, Curious Portraits and The Curious Kitchen and check out her artwork. Lisa is an award winning artist, illustrator, and textile designer who lives and works in Manhattan's West Village. Explore her blog and take her apartment tour and kitchen tour while sitting at your computer, and get to know her and her work. Both are truly amazing! In Emmett's phone call to me, he claimed that my pincushions and I are the talk of the squirrels in Lisa's courtyard! I didn't find this so surprising. My last blog relates that bits of drama and craziness seem to follow me and what could be more special than to be recognized by this silly squirrel. It is not surprising that he is carrying on to his friends about the woman who makes pincushions with only crushed walnut shell filling and NO nuts!! Lisa will receive a replacement pincushion as a reward for her pincushion testimonial story, though her next pincushion comes with a warning to keep it away from window sills when the windows are open, as they might be still be irresistible temptations for those seeking nuts. It did cause me to wonder if I should put a lucky walnut in the middle of each pincushion, but then I would have to warn those with nut allergies to purchase only those with polyester filling! Thank you Lisa and Emmett for this chuckle-of -the-day and wonderful story! Don't forget to read Lisa's own account and how she dealt with such an intruder by clicking on her blog above! !I am so lucky to have my pincushions recognized by Emmett and his friend, Lisa and am grateful to this squirrel for bringing us together again! About Emmett McCarthy : To talk to Emmett is like talking to your best friend that you have known all your life. He is warm and fun, and as I told him, not at all intimidating, despite his awesome talent. Although "famous", he seems quite "normal" and "down to earth"! His fashion designs are pure class. I admire and recognize such sewing and design talent despite me being a likely contestant for What Not to Wear. I had no idea that he has more than a high-fashion dress shop in New York City. He actually has lines of bags, shoes, and clothing that you can view on your computer at Emmett McCarthy EMc2 Brand Book on Vimeo. Not to be missed is his story of how he became a well-known fashion designer in Our Pal Emmett! Emmett's sister lives in a nearby town and he has promised to pay me a visit. I am honored and delighted and look forward to getting to know Emmett better.